Even when taking your first steps in wide format printing, you deserve a high-end printer featuring latest piezo inkjet head technology, a high-precision mechanical design, latest generation electronics and high quality inks. 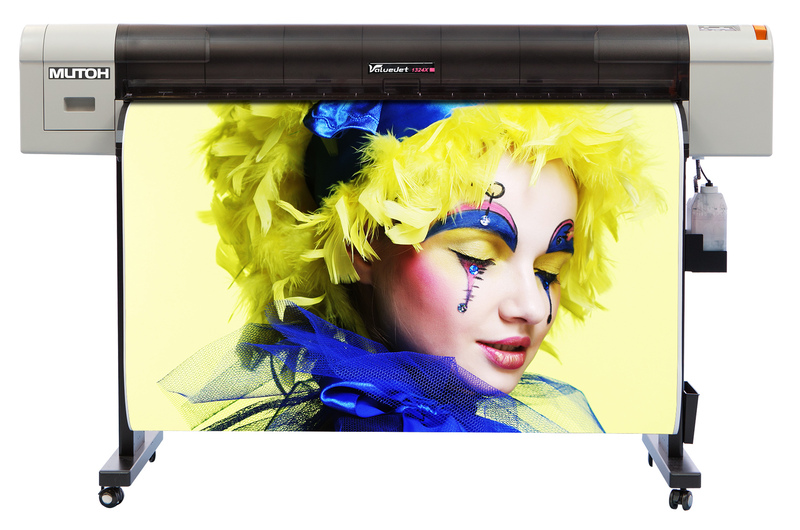 ValueJet 1324X is Mutoh’s fourth generation 54” (137 cm) wide single head sign & display printer. In line with our core philosophy to deliver products with technology proven to be faster, more reliable, more cost effective and more efficient, we incorporated our pioneering print automation technology into the VJ-1324X wide format printer to bring you the best equipment for your application. No worries. Just print ! Ideal for small to mid-range sign makers & print providers, the ValueJet 1324X single head sign & display printer (1371 mm – 54”) delivers unrivalled print quality and an unprecedented level of ease of use! Easy to install, operate and maintain, the machine utilises Mutoh Eco Ultra and UMS inks. Experienced as well as starting sign makers will enjoy worry-free printing. Flexible, reliable and able to deliver excellent print quality for short print runs as well as volume production runs, the robustly built & cost-effective ValueJet 1324X delivers sellable production speeds up to 16.4 m²/h and will prove to be a reliable workhorse for all high-quality indoor and outdoor graphics. A perfect match for businesses with medium and higher print volumes. Mutoh’s award-winning Intelligent Interweaving (i²) & DropMaster print technology offer predictable and repeatable output quality. The VJ-1324X produces best-in-class speed and the highest levels of quality to satisfy your customers with output which will simply stand out and make heads turn. The VJ-1324X is suited for the production of long term outdoor prints on a wide range of uncoated and coated substrates : posters, backlit signage, wall coverings, point-of-sale displays, vehicle graphics, stickers and much more. Apart from outdoor applications, the ValueJet 1324X is also an excellent choice for durable photorealistic prints for indoor use. Using Mutoh Universal Mild Solvent (UMS) inks on Grafityp Ecological non-PVC self-adhesive film (GEF-ES) you will be able to deliver safe & certified prints meeting the most stringent EU requirements for indoor air comfort.